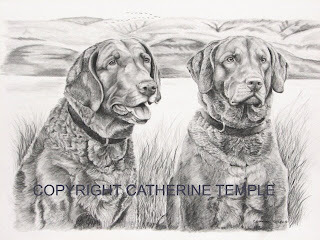 These two Chesapeake Bay Retrievers were a very special commission for a very special friend. She chose to have it done in graphite pencil because it has such a timeless, elegant simplicity to the medium. Both of these dogs have passed on now. I personally knew the dogs and had hunted with my friend and her husband in past years. It took us awhile to get the right pictures together that best captured Punkin and Belle and because the dogs were so special it brought back a lot of memories and a lot of emotion. Anyone that has truly loved any animal can understand that. I hope you enjoy seeing this painting as much as I enjoyed doing it. 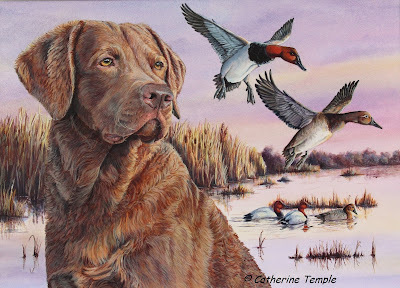 It was a special honor for me to do this for them because it pays tribute to some wonderful dogs and because a part of my life is wrapped up in this, too. Give your furry friends an extra hug today for the love they give us is exceptional and their time with us way too short.